Monologue- speaking and listening piece. 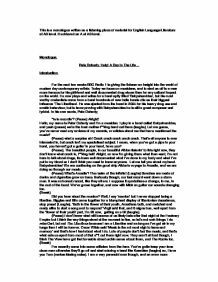 This is a monologue written as a listening piece of material for English Language/Literature at AS level. It achieved an A at AS level. Monologue. 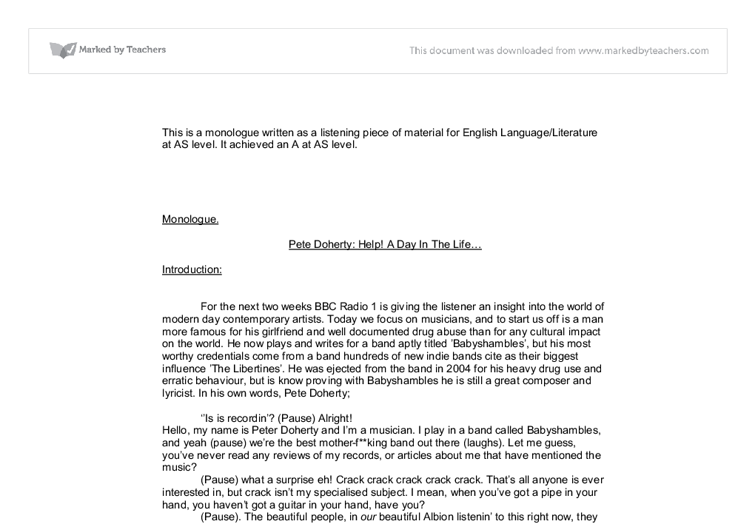 Pete Doherty: Help! A Day In The Life... Introduction: For the next two weeks BBC Radio 1 is giving the listener an insight into the world of modern day contemporary artists. Today we focus on musicians, and to start us off is a man more famous for his girlfriend and well documented drug abuse than for any cultural impact on the world. He now plays and writes for a band aptly titled 'Babyshambles', but his most worthy credentials come from a band hundreds of new indie bands cite as their biggest influence 'The Libertines'. He was ejected from the band in 2004 for his heavy drug use and erratic behaviour, but is know proving with Babyshambles he is still a great composer and lyricist. ...read more. Let me tell you about my band. Babyshambles! We are continuing on the good ship Albion's voyage to Arcadia, and we are doing so through our music. (Pause) What's Arcadia? The realm of the infinite! (Laughs) Benches are made of denim and cigarettes grow on trees. Seriously though, our last record went down a storm man. It was an honest record, like they all are. I suppose it symbolises a change, in me, in the rest of the band. We've grown together, and now with Mick on guitar our sounds changing too. (Break) Did you hear about the reunion? Well, I say 'reunion' but I never stopped being a libertine. Biggles and Bilo came together for a triumphant display of libertonian decadence, stop press! (Laughs). 'Both in the flower of their youth, Arcadians both, and matched and ready alike to start a song and to respond' Virgil said that, and it reigns true, well apart from the 'flower of their youth' part, I'm 28 now, getting on a bit (laughs). ...read more. no, I love you Tom (makes kissing noise). I am a very paranoid man though, and an even more paranoid boy, I'll let you decide which is worse. The fans think I'm neglecting them I think. They've gotta realise though that I'm just as accessible as I ever was, I'm just not around as much. Bands like Razorlight, they never played for fans in their own front rooms, because they're selfish, they don't understand how important the fans are. I'm trying to get the close proximity between our fans back because I went a bit wayward a few months back when the tabloid fodder was at its worst. (Break) I'm not a cretin, and I'm not a f**ker, I'm not gonna f**k anyone over, but that's not me trying to change your opinion of me. I think the term 'junkie rocker' is a caricature of me, I'm a poet, I like Queens Park Rangers, Tony Hancock, Oscar Wilde and making love, yeah. That's it.'' ...read more. I'm in the same region as eighty stone teenagers and hundred year old ladies with tuberculosis. I'm afraid. I don't want to die. There's so much I haven't done. So much I could do. It's not my turn yet. I looked after myself. One of them is a picture of Hamilton looking sad and upset, and the other an image of a fan taunting him. This is a contrast because they show the images side by side, displaying the two angles of the main article. Or, more likely, we'll allow ourselves to be bribed by the extra day off, forget all about storming the Bastille and come to associate said free day off with William and Kate, searing the idea that they're good people onto our brains forever. This seemed to work to good effect by using rhetorical questions and specific dialogue to attract the audience's attention. Animal Farm gets people relating the animals to how the Russian revolution happened and thinking about historical scenarios, however I don't believe Orwell wrote his piece to create this effect. He was clenching his signature silver revolver, it glistened in the moonlight. "I only have a single stun bullet so I'll have to make this shot count, because if I miss... may God have mercy on our souls." Jonah stared deep into Celeste's fearsome eyes, pools of yellow. Mason: [even quieter, spotlight fading] Who, sir? Stanhope: [sadly] Raleigh. He looked up to me. I was his hero. I've only just realised what Osbourne meant that day, about hero worship, the day Raleigh came into the trenches: "It often goes on all through life". The woman climbed into it grinning to herself. Jade had always been good at hide and seek. John walked through the magnificent ship is jaw dropping almost to the floor. This was the life he was always meant to live he thought as he paused every once in a while to gaze at the artwork plastered on the walls.